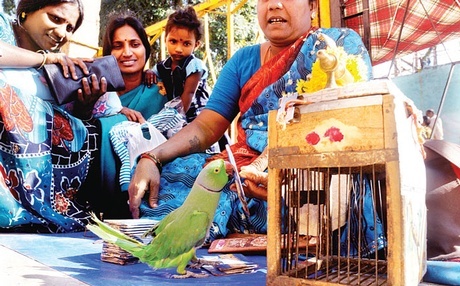 The “astrologer parrots” or “fortune teller parrots” are mostly found in the Tamil Nadu area in India, in the Little India district in Singapore and in Pakistan, where similar species can be also found. This practice involves the use of trained parrots that help the fortune-teller by choosing a Tarot card in order to predict the future of their customers, especially that future related to love, marriage, work and clients. The fortune- teller usually keeps one or two parrots in a cage and frees them when a customer requires their service. 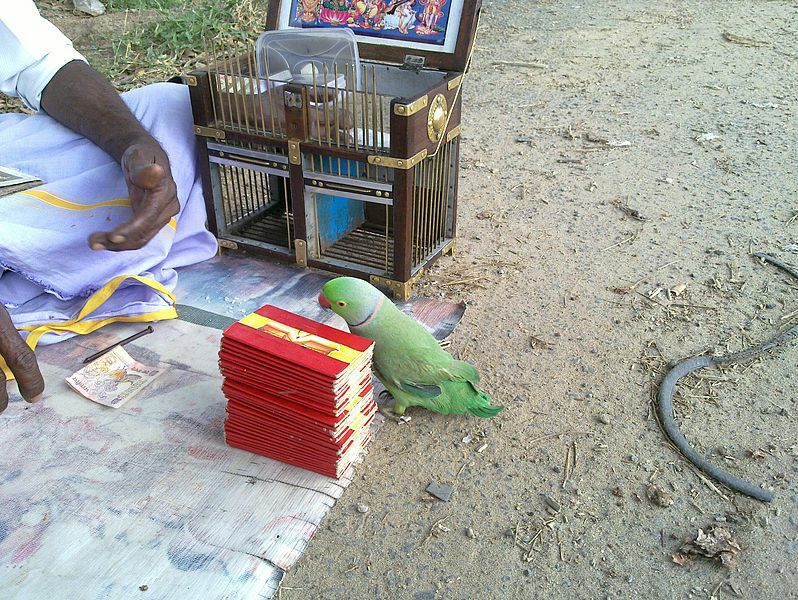 The parrots are trained to pick a card, give it to its owner and go back to the cage. According to the fortune-teller, the parrot would pick the card depending on the customer’s name, other factors or just following its "insticts". The astrologer would then read this card to the customer. Usually these cards show images of hindu gods, Buda or even the Virgin Mary holding Jesus Christ. This kind of practice used to be very common in India in places like beaches, parks at sunset or even by the roads. However, it is declining due to the increasing lack of customers and because it was recently forbidden. Actually in India, it is against the law to capture, sell and keep a native bird in captivity. In Singapore, the clients are usually tourists who pay 5 Singapore dollars for the prediction. In 2010 one of these parrots got pretty famous after guessing most of the results of the FIFA World Cup. Mani, that’s the parrot’s name, has been “working” for its owner since 2005. They became so famous that nowadays they receive 10 clients per hour. According to the orthodox Muslims, this practice is forbidden for being considered superstitious, however, the Pakistanis fortune tellers do not agree. Fortune tellers usually give to their clients some kind of tasks or “homework” to do like for example repeating Koran’s or Karmas verses in order to make the prediction come true.